Smooth action, tough performance, and lots of fun, this little workhorse has a silky-smooth drag for longlining, spider rigging, or any trolling technique. Featuring a stainless steel cap and options for both right- and left-hand retrieves. 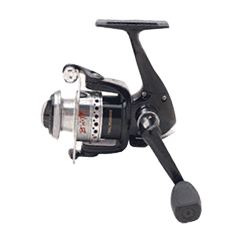 5BB (4+1), 5.1:1gear ratio, with line capacities of: 4lb/220yds, 6lb/150 yds, or 8lb/100 yds.